As part of the Cape Town Platform’s Knowledge Transfer Programme, and emerging out of the Climate Change Think Tank, a third round of city/university collaboration is currently underway. City officials who have undertaken climate change innovations in their sectors were invited to apply for two month practitioner fellowship at the University of Cape Town, hosted by the African Centre for Cities, ACC. Nine officials have been selected along with academic partners from a range of disciplines at the University of Cape Town and together they will co-produce a chapter for a book. The officials are being supported in writing-up their account of policy development within their respective focus areas through workshops facilitated by Lucia Thesen and Mathilde van der Merwe, from the Cente for Higher Education Development at the University of Cape Town. 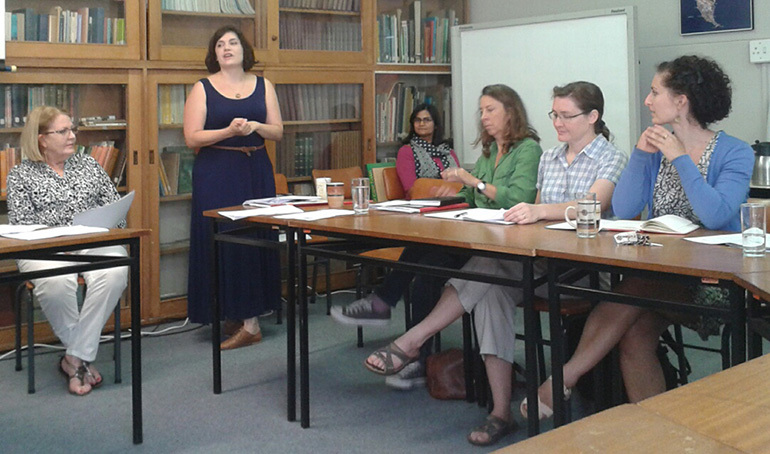 From left: Dianne Scott (Managing Editor); Amy Davison (City co-ordinator of Knowledge Transfer Programme, Environmental Resources Management); Zarina Patel (Mistra Urban Futures Cape Town Platform Director, African Centre for Cities); Pippin Anderson (University of Cape Town writing partner, Environmental and Geographical Sciences); Helen Davies (Editor from City of Cape Town, Environmental Resource Management); Liza Cirolia (University of Cape Town writing partner, African Centre for Cities). The draft title of the book is ‘Urban Development and Climate Change: Experiences from the City of Cape Town’. The books aims to show the embedding of climate change innovations in policy and practice in a range of sectors across the municipality, illustrating the lessons learnt in local government and how the City of Cape Town is moving beyond ‘business as usual’. The book also includes reflections of how knowledge is shared and co-produced in this way, creating a new platform for meaningful interaction between academics and practitioners. Sea-level rise and integrated coastal zone management.